Master Sgt. 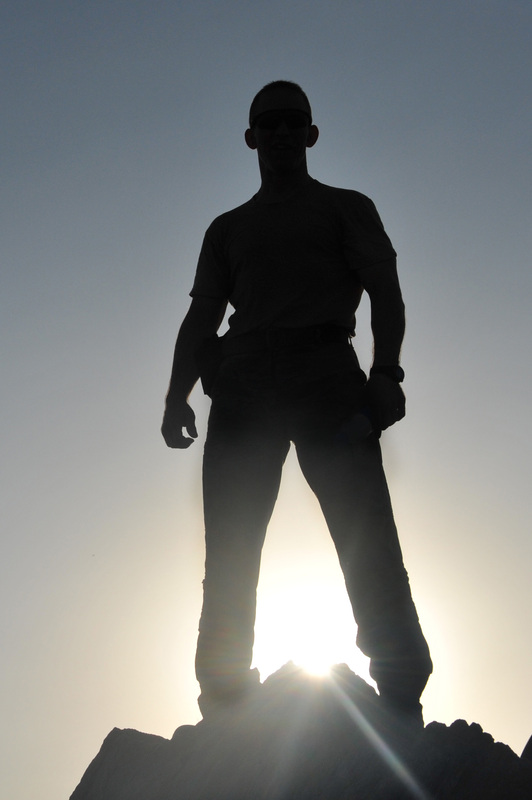 Steve Horton, ISAF Joint Command, stands on top of “Ghar” Mountain, a 1500 ft. mountain on Kabul Military Training Center in Kabul, Afghanistan, Aug. 20, 2010. One of the reasons I’ve not been writing here over the past four years is that I’ve been processing. These last four years have represented a dramatic climax in my life, a climax that began with that discovery nine years ago. I’ve completely changed the way I look at religion and relationships. I’ve dropped my faith. My kids’ mom and I have parted ways. And I’ve finally been dealing with many of the family-of-origin issues that had been pressing on my mind. This is all good news. But all of it also dominates the thoughts and emotions, as I forge a new path through life’s jungle, leaving little time for blogging. But another reason I’ve been silent is that I’ve been afraid to be genuine. I have been increasingly sharing my story on my Facebook timeline, and most of those posts are public. But that’s always felt like a different space to me. This blog is my public face, and I was afraid that if I published my true, raw thoughts here, I’d turn away followers, and that after I came through the change, I’d regret it. It’s the classic vulnerability trap: you need to open up in order to connect with others, but doing so exposes you to emotional risk. Pretty silly, actually, as my posting frequency has been so low for the past four years. But when you’re in that space, it’s not about how objectively silly it is; it’s about how safe you feel. And when you’re story has just reached a dramatic climax in which you lost almost every friend you had, then yeah, you feel pretty unsafe. There is so much I can write about. To start with, I can go through all of my old posts and write updates to them. I’ve started that project once or twice during the past few years, and I was surprised to discover that there’s very little that I would outright reject. But there are bits that I’d amend. And there’s so much that I did not originally say, but which I want to say. But mostly, I want to tell my story. I want to tell my story, because I never felt safe telling it before. I want to tell my story, because I need practice validating myself. I want to tell my story, because I need to remind myself that I need no one’s permission to own it. I want to tell my story, because so many of my progressive friends don’t know what it’s like to live inside a fundamentalist family and religious community. I want to tell my story, because telling our stories is the only way to truly connect with others. I don’t like to make my entire story about my journey out of religion, but the truth is that it mostly is. Facebook showed me one of my status updates from 9 years ago. Thank the Lord, for He is good; his kindness is forever. When I shared this nine years ago, I was going through a depression so deep I wanted to kill myself just to make the pain stop. And on that day, I discovered the work of psychologists Joe Griffin and Ivan Tyrrell. They suggested that maybe I was depressed because my emotional needs weren’t getting met. At the time, this was a revolutionary thought for me, and I didn’t even realize it was happening. All I knew was that Griffin and Tyrrell had validated me, had validated my needs where my entire social circle had failed to do so. And I liked it. I needed it. In the days and weeks that followed, I began being more aware my own needs, taking care of myself better, and doing kindnesses for myself. Psychologist Ross Rosenberg suggests that this is the first step to healing from what he calls Self-Love Deficit Disorder, and the first step to extricating yourself from an abusive relationship. For me, it was the first step on a journey in a better direction that allowed me to leave behind the Judeo-Christian religions and their narcissist god. “Thank the Lord, for He is good; his kindness is forever.” This psalm we used to sing and recite in a dozen different forms, and I had memorized it in both English and Hebrew. But what is Yahweh’s “kindness,” really? At best, it is the random forces of nature, sometimes wonderful and sometimes horrible. It’s a kindness you can’t count on. This psalm is spiritual gaslighting. I know what kindness looks like, and it does not involve natural disasters, pediatric cancer, or emotional abuse. I’ve become more comfortable accepting true kindness—especially from myself—rather than chanting the nonexistent kind in hope that this will somehow magically increase the happiness in my life. I learned that I was valuable, not because of what God had supposedly done for me—saving me from a fate that he was going to inflict on me—but I was valuable just because I was. And as I learned this, my spirit grew such that it could no longer fit within the oppressive theological box that my religious friends and family needed me to stay inside. That’s why you’re likely to see many more religious posts. If you thought Richard Dawkins was an angry atheist, you ain’t seen nothin’ yet. And as Evangelical leaders justify their supremacism in the political and social spheres, you can expect me to comment on the role that Evangelical stories play in their extremism. You can expect to see terms like “divine negging” and “spiritual gaslighting.” And you can expect me to pull out religious stories, both the beautiful and the ugly, and present them unvarnished.